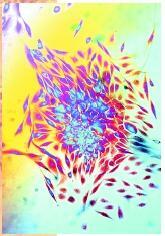 Normal tissue development depends on a balance between cell multiplication and cell death. When cells multiply faster than they die, the result is an abnormal tissue growth called a tumor (neoplasm). The study and treatment of tumors is a branch of medicine called oncology. Causes of Cancer cells metastasizing and spreading outward in a culture (blue). Not all tumors are cancerous. Benign tumors are surrounded by a fibrous capsule, grow slowly, and do not spread to other organs; although they are nevertheless sometimes fatal. A wart is a benign tumor. Malignant tumors have no capsule, grow rapidly, and shed cells that can "seed" new tumors in other organs, a phenomenon called metastasis . The word cancer refers only to malignant tumors. The word literally means "crab." It was coined by the ancient Greek physician Hippocrates when the tangle of blood vessels in a breast tumor reminded him of the legs of a crab. Cancers are classified according to the type of tissues or cells in which they originate (see Table on page 112). A primary tumor is a tumor in the site of origin, and a secondary (metastatic) tumor is a tumor in a new site resulting from the spread of cells from the original tumor, for example, a brain tumor resulting from cells that originated in colon cancer. Most cancer is caused by environmental agents called carcinogens. Carcinogens include chemicals such as cigarette tar, nitrites (used as food preservatives), and many industrial chemicals; viruses such as the hepatitis B and herpes simplex 2 viruses; and ionizing radiation such as X rays and gamma rays. All of these agents are mutagens; that is, they cause mutations, or changes in deoxyribonucleic acid (DNA) and chromosome structure, which in turn result in uncontrolled cell division. The risk of cancer is often hereditary, and many forms of cancer have been traced to two types of genes : oncogenes and tumor-suppressor genes. 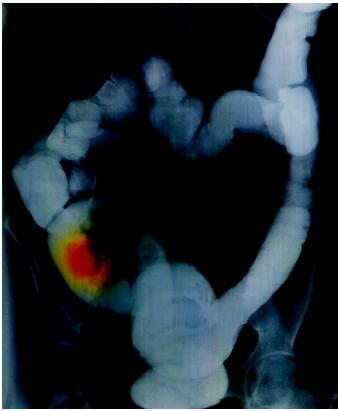 Colored barium enema X ray of a human abdomen showing cancer of the ascending colon. The tumor appears over the right pelvic bone (left on image). dysfunctional receptors that act like switches stuck in the "on" position, sending signals for cell division even when there is no growth factor bound to them. Many cases of breast and ovarian cancer are due to an oncogene called erbB2. Tumor-Suppressor Genes. Tumor-suppressor (TS) genes normally inhibit cancer by opposing the action of oncogenes, promoting the repair of mutated DNA, or controlling tissue development. When TS genes are mutated, these protections are lost. A TS gene called p53 has been implicated in leukemia and colon, lung, breast, liver, brain, and esophageal cancer. Thus, oncogenes promote cancer and TS genes suppress it. They can be loosely compared to the accelerator and brake on a car, respectively. A defect in either one causes the "car," cell division, to run out of control. Cancers typically require more than one mutation before they develop; thus, colon cancer involves damage to at least three TS genes on chromosomes 5, 17, and 18, plus activation of an oncogene on chromosome 12. It may take many years for so many mutations to accumulate in a single cell, which is one reason cancer is more common among the elderly than among young people. By competing with healthy tissues for nutrients, often causing the body to break down its own proteins (muscle, for example) to feed the "hungry" tumor, or failing to make enough red blood cells and platelets because stem cells are diverted into producing the abnormal white blood cells of leukemia. Cancer is normally treated by surgery, chemotherapy, or both, depending on its location, type, and extent. Other approaches are radiotherapy (using radiation to destroy tumors) and immunotherapy (providing antibodies or immune cells to attack cancer cells). Some forms of cancer are highly treatable, such as skin cancer, whereas others offer much less hope of recovery, such as pancreatic cancer. Fauci, Anthony S., et al. Harrison's Principles of Internal Medicine, 14th ed. New York: McGraw-Hill, 1998. McCance, Kathryn L., and Sue E. Huether. Pathophysiology, 3rd ed. St. Louis: Mosby, 1998. Varmus, H., and R. A. Weinberg. Genes and the Biology of Cancer. San Francisco: W. H. Freeman and Company, 1993. The top ten causes of cancer mortality in the United States, ranked from highest to lowest, are cancers of the lung, colon, breast, prostate, pancreatic, leukemic, ovarian, stomach, nervous system, and bladder.